Alter even bragged: “According to a metric created by political scientist Brendan Nyhan, Obama set a record earlier this month for most days without a scandal of any president since 1977.” Nyhan’s methodology insisted that a president doesn’t have a scandal until The Washington Post calls it a “scandal” by using that precise word. – Solyndra: In the first two months of 2002, the Big Three networks reported a stunning 198 stories on the Enron bankruptcy, often tying the fiasco to President Bush. By comparison, since declaring bankruptcy on August 31, 2011, despite a half-billion dollars in federal loans from the Energy Department through Obama donor connections, ABC, CBS, and NBC filed a grand total of 24 stories on Solyndra, and barely connected it to Obama -- even as Obama told ABC he had no regrets, and even as the promise of “green jobs” demonstrably collapsed. – MF Global: An investment company run by former New Jersey Gov. Jon Corzine (a major Obama fundraiser) declared bankruptcy on Halloween 2011 and admitted they lost more than a billion dollars of customer money that was supposed to be kept separately from risky investment schemes. This scandal garnered only six full stories and 16 briefs. 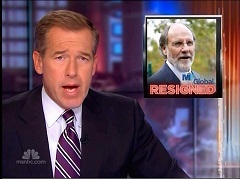 Only NBC once mentioned Corzine was a Democrat. None even whispered any connection to Obama. – Gibson Guitar: Some scandals are less weighty, but more interesting to viewers. Federal agents twice raided the plants of Gibson Guitar in Tennessee to investigate whether they improperly imported wood from Madagascar and India, but waited for almost a year before settling with the guitar maker for a $300,000 fine. No one found it newsworthy that Gibson’s CEO is a Republican donor, while other guitar makers who weren’t Republicans were not raided by the government over wood imports. – Reverend Wright: After a long silence after the inauguration, as the networks pretended Obama’s longtime reverend Jeremiah Wright didn’t exist, network stories erupted in mid-May at the whisper of an idea that Republicans might exploit him in an ad. But the networks offered nothing on an interview in Ed Klein’s book The Amateur, where Reverend Wright claimed in a taped interview that Obama friends offered money for silence. A recent Gallup survey concluded that only 21 percent of those surveyed had confidence in television news. As the nonpartisan Tyndall Report found, broadcast networks racked up 171 minutes of royal-wedding coverage and 111 minutes on the Michael Jackson wrongful-death trial on the evening news in 2011. But Obama scandal news – and hence, any notion the media act as a watchdog or a check on government – was almost nonexistent. But scandal coverage has long been an “ideological thing.” That begins with the assertion that there are zero Obama scandals for journalists to cover. In the Bush years, the TV networks and national newspapers thought most of what President Bush did was a scandal: the Iraq war was a scandal, and so were several spinoffs (Plamegate, Abu Ghraib prisoner humiliations, and so on). The war on terror was a scandal, from the detention and harsh interrogations of terror suspects at Guantanamo to the monitoring of phone conversations with terror suspects abroad. Whatever Obama has done to extend this battle (after dumping the “war on terror” mantle), from keeping Gitmo open to unleashing drone attacks – even one killing a radical-Muslim American citizen – are no longer treated as scandalous. To study the media “miracle” of scandal denial, MRC analysts reviewed the coverage – or more precisely, the stunning lack of coverage – of just a few Obama scandals and allegations, large and small, on the morning and evening news shows of ABC, CBS, and NBC. Deaths, guns, whistle-blowers and the highest law officer in the land stonewalling a congressional investigation are the juicy ingredients of a story network news reporters would love to cover – if a Republican president were in office. In addition to a quiet media elite, Obama scandals were slow to emerge in 2009 and 2010 because Democrats were in the congressional majority in both houses. When Republicans took over the House of Representatives in 2011, including Rep. Darrell Issa at the helm of the House Oversight and Government Reform Committee, the story began to change. 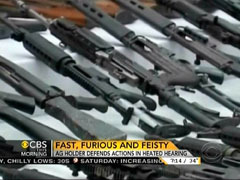 In 2009, under Barack Obama, the Bureau of Alcohol, Tobacco, Firearms, and Explosives began “Operation Fast and Furious,” which allowed licensed gun dealers to sell weapons to illegal straw buyers, hoping to track the guns to Mexican drug cartels, with the hope of tracking the guns as they were transferred to higher-level traffickers and key figures in Mexican cartels, with the expectation that this would lead to arrests. But it all went wrong. Only one network and one reporter – CBS’s Sharyl Attkisson – dared to find a scandal, at least until the House of Representatives took the historic step of voting to hold Attorney General Eric Holder in contempt of Congress for failing to produce documents in the scandal. Attkisson was alone in holding the government accountable. Before the story erupted in June of this year, she filed 29 stories and one brief on CBS. ABC had aired only one brief on the June 15, 2011 Good Morning America. In a bizarre turn, ABC White House correspondent Jake Tapper asked Obama about Fast and Furious in October 2011, but ABC refused to allow any soundbite on that subject to appear on Nightline, World News or Good Morning America (which all played clips of the interview.) Instead, on Nightline, ABC found time to air Tapper and the President playfully discussing children’s books and the greatness of Dr. Seuss. 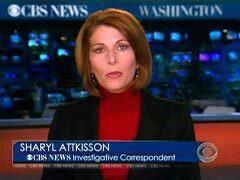 On the November 8, 2011 CBS Evening News, Sharyl Attkisson focused on another deception, that Holder claimed in February there was no gun-walking. Holder bizarrely claimed under GOP questioning that his letter was somehow not false, just inaccurate: “What I said is it contains inaccurate information...I don’t want to quibble with you, but ‘false’ I think implies people making a decision to deceive.” Why would reporters not grasp on a public official saying it’s not a falsehood if it was unintentionally false? Williams sounded like he was angry that someone gave him a reason to cover this scandal. “Those not following the complexities of all of it” could be defined as anyone who relied on NBC News for reporting on the Obama administration. It should be noted Chris Hansen, on the April 17, 2011 edition of NBC’s magazine show Dateline, briefly mentioned that the ATF “as part of an undercover operation, actually allowed hundreds of guns to be smuggled to the Mexican drug cartels.” However, Hansen never linked Holder to the operation or even mentioned Terry’s name. Hansen’s failure to mention Terry’s name is particularly galling considering his mother, Josephine, repeatedly demanded Holder apologize for her son’s death, most recently after a February 2, 2012 hearing as she called the Attorney General a “coward politician.” Josephine Terry is not being granted the same cause celebrity status that the networks gave George W. Bush-harassing “peace mom” Cindy Sheehan. 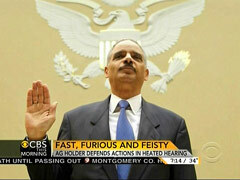 The networks offered no brickbats for Attorney General Holder. He submitted himself to zero network TV interviews over the last two years. It’s quite a contrast to 2007, when the networks were loaded with hyperbole on the allegedly massive scandal of a smattering of U.S. attorneys fired by the Bush Justice Department. Then-Attorney General Alberto Gonzales tried to put out the blazing story by appearing on five morning-news shows on the same day – March 14, 2007. When the networks take months and even years to acknowledge a Democratic scandal exists, it also helps to keep the Obama scandals from entering the satire stream of late-night comedy shows. At the White House Correspondents Dinner on February 2, 2012, ABC late-night host Jimmy Kimmel mocked Obama from the left: “Even some of your Democrats think you’re a pushover Mr. President...They would like to see you stick to your guns and if you don’t have any guns, they would like to see you ask Eric Holder to get some for you.” The networks didn’t replay the joke. The Washington Post crunched the numbers in September 2011: Instead of creating 65,000 jobs, as promised, the $38 billion loan program which included Solyndra could only claim 3,545 jobs. But no one on TV noticed that, because network coverage of the “green jobs” concept tilted in Obama’s favor. “We have gotten the message. Green-collar jobs are the wave of the future,” co-host Diane Sawyer cheered on ABC’s Good Morning America on April 15, 2009. MRC’s Business and Media Institute found that out of 52 network stories that mentioned the administration’s “green jobs” program, only four (eight percent) bothered to include any critics at all. California-based Solyndra was the first solar company to be given a loan from the Department of Energy under President Obama, a loan for $535 million dollars in 2009. On August 31, 2011, Solyndra declared bankrupcy and suspended all production, laying off 1,100 employees and sticking the taxpayers with the bill. In the first two months of 2002, the Big Three networks reported a stunning 198 stories on the bankruptcy of Enron, a Houston-based energy company. Enron CEO Ken Lay had been to the Clinton White House, but the networks zoomed in on George W. Bush. Democrats denounced George W. Bush’s “Enronomics” and “Enronizing” of Social Security. 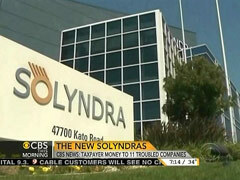 In the two months after its August 31 bankruptcy filing, ABC, CBS, and NBC filed a grand total of 15 stories on Solyndra. That’s an Enron-to-Solyndra comparison of more than 13 to 1. Since last Halloween, the networks have offered only nine more stories (and six of them were anchor-read briefs). The last one came from CBS on January 13. Even when Mitt Romney made a surprise visit to stand in front of the empty Solyndra headquarters on May 31, 2012, the networks only mentioned it in passing, offering no stories. CBS reporter Jan Crawford asked Mitt Romney one solitary Solyndra question on CBS This Morning on June 1. STEPHANOPOULOS: Do you regret that? OBAMA: No, I don’t, because if you look at the overall portfolio of loan guarantees that have been provided, overall it’s doing well and what we always understood was that not every single business is gonna succeed in clean energy. But if we want to compete with China, which is pouring hundreds of billions of dollars into this space, if we want to compete with other countries that are heavily subsidizing the industries of the future, we’ve got to make sure that our guys here in the United States of America at least have a shot. Now, there are going to be some failures and Solyndra is an example. STEPHANOPOULOS: And you were getting warnings not to back that company up, not to visit? OBAMA: Well, you know, hindsight is always 20/20. On October 7, the same Obama administration that pledged to be the most transparent ever engaged in a late-Friday document dump. The pile included e-mails showing a top Obama fundraiser and Energy Department official, Steven Spinner — who had supposedly recused himself from Solyndra’s loan application because his wife worked at a law firm representing the solar energy company — persistently pushing his colleagues to approve the deal. Even though these e-mails were sensational enough to make it onto the front-page of The New York Times, the networks never found a moment over the long Columbus Day weekend to mention them, just as they skipped the earlier news that Jonathan Silver, who ran the Energy Department loan program that handed more than $500 million in taxpayer money to Solyndra, had resigned. When two Solyndra executives took the Fifth Amendment before Congress in September, ABC and NBC skipped that news, too, while CBS offered about 25 seconds of coverage. On Halloween 2011, MF Global Holdings filed for bankruptcy with a shady mystery: some $1.6 billion was missing from their customers’ accounts. Financial analysts blamed the company’s CEO, Jon Corzine, a former Democratic U.S. Senator and Governor of New Jersey, who became the center of an FBI investigation. Then there were strange scandals that had great temporary news appeal. Take the federal raid on Gibson Guitar plants in Memphis and Nashville on August 24, 2011 over the notion that they were improperly importing wood from India. It wasn’t against American law, but the feds asserted it violated an Indian law under something called the Lacey Act. Gibson had to stop manufacturing and send workers home for the day so the feds could investigate. Agents also raided the guitar-maker in 2009, asserting improper importation of ebony wood from Madagascar. Both India and Madagascar found nothing wrong with Gibson. Network coverage? Zero. ROBERTS: Now here’s the really interesting part. Had Gibson imported this from India as a finished piece, it would have been perfectly legal to import. So it’s not the wood itself, it’s the amount of manufacturing that went into it. Which has led Gibson to say that the U.S. government, this White House, this administration wants to ship U.S. jobs overseas. There’s about 40 people here at Gibson that work on putting this together. And according to Bruce Mitchell, who’s the lead counsel for Gibson, I talked to him yesterday. He said that whole idea flies in the face of the President’s speech tomorrow about putting Americans back to work. Here’s what he told me. BRUCE MITCHELL, GIBSON CHIEF LEGAL COUNSEL: Gibson, you know, is 100 percent American made, 100 percent American made. We’re proud of that. We export 60 percent of what we produce in the United States. So if you take in context, and in fairness to President Obama’s speech “Let’s Put America Back to Work.” More jobs, more exports. More exports, more jobs. Gibson is the poster child for that. ROBERTS: Now here is the other part of this that’s really interesting. This is exactly the same type of wood, in exactly the same form that every other guitar manufacturer in America imports and hasn’t yet been targeted by the federal government. Which leads some people to believe that because Henry Juszkiewicz, who’s the CEO of Gibson, is a Republican and has donated heavily to Republican candidates, whereas some of the other manufacturers are led by Democrats, that maybe there is a political motivation to all of this. Klein said no, “Because I don’t think Whitaker would have done something as important as that without -- first of all, he was a confidante of Barack Obama’s. I mean, they were as close as brothers could be. And I don’t think he would have done something as dramatic as offering $150,000 bribe without checking with his pal, Barack, and saying, maybe we should do something about silencing this minister.” Network coverage? Zero. Perhaps this story is too inflammatory to accept from such a disgruntled source. But these same networks have been eager to welcome authors with all kinds of harsh allegations about Republican presidents. For example, in 2004 NBC’s Matt Lauer welcomed Kitty Kelley to unload personal allegations against George W. and Laura Bush. In 1999, CBS even put an anti-Bush author on 60 Minutes claiming Bush had been arrested for cocaine possession in 1972. That anti-Bush author, J.H. Hatfield, had been convicted in 1988 of paying a hit man $5,000 to murder his former boss with a car bomb. CBS reported his claims anyway. The networks wouldn’t touch allegations of a Wright hush-money offer. But CBS and NBC each briefly sprung into action on Wright at the whisper of a chance that a Republican would run an ad against Obama’s re-election using Rev. Wright. The media elite insisted it would be terrible if super-PAC ads raised uncomfortable associations like Wright’s connection to Obama. But Schieffer didn’t find it terrible when his own network ran sleazy cocaine allegations against Bush, or when NBC put on “expert” like Kitty Kelley to make unsubstantiated attacks on Bush. The news networks, in their own imaginations, are never as sleazy as TV ads. A recent Gallup survey concluded that almost 80 percent of those surveyed did not have confidence in television news. Part of that distrust comes from ideological bias, and part of it comes from the media’s ratings-conscious addiction to human-interest stories and celebrity coverage. Those two trends can combine, and demonstrate a media more intensely covering fluff than the stuff of scandal. As the nonpartisan Tyndall Report found, networks racked up 171 minutes of royal-wedding coverage and 111 minutes of the Michael Jackson wrongful-death trial on the evening news in 2011, Obama scandal news – and hence, any notion the media acts as a watchdog or a check on government – was almost nonexistent. If the networks were interested in repairing their deeply damaged public image as watchdogs of government during Democratic administrations, they would stop this disturbing trend of going blind, dumb, and deaf on Democratic scandals – to the point of skipping over broadcasting their own scandal questions to the President so they can make time to talk about Dr. Seuss books.